New York: Crown Publishers First edition. Signed by the author at the title page. The bottom edge of the spine is very slightly bumped, otherwise the boards are bright and clean, the pages are crisp and clean, without tears, the text is unmarked, and the book is tightly bound and in near fine condition. The dustwrapper is very lightly shelf worn, otherwise it is bright and clean, without tears, unclipped, in mylar, and in near fine condition. (NF/NF.) 463pp.. Signed by Author. First Edition. Hard Cover. Near Fine. 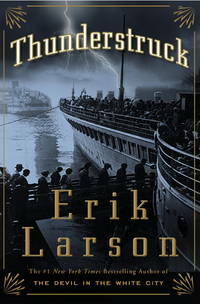 Erik Larson is the bestselling author of the National Book Award finalist and Edgar Award–winning The Devil in the White City . He lives in Seattle with his wife, three daughters, and a dog named Molly.